Is Buttermilk Good for You? Made by churning cream, buttermilk is actually a liquid byproduct of butter making. Since cream is left to sour for several hours (up to 8 hours), many people also consider it a 'cultured' or 'fermented' dairy product. Thanks to its mildly sour taste, you can use it to tenderize meat. It also works great to add some creaminess to soups and sauces. While it is popular, many people still wonder if buttermilk is good for health because of its calorie content. So, should you include it in your diet? Yes, it is. Just like yogurt, it provides you with healthy living microorganisms that eliminate bad bacteria in the gut and boost immune system. These beneficial microorganisms can survive through your stomach and become active when they enter your intestines. Moreover, you enjoy many other benefits that come from some of the essential nutrients found in buttermilk like calcium. Moreover, it contains less fat and that is another reason it is good for your cardiovascular health. Is buttermilk good for you? Yes, it is, and here are some of the reasons why you may want to include it in your diet. Buttermilk is rich in calcium and provides you with 284mg of calcium in every cup. The recommended daily intake of calcium is 1,000mg, which means that a cup of buttermilk provides you with 28% of your daily requirement. By increasing your intake of calcium, you can help keep your bones strong and your teeth healthy. It also prevents osteoporosis and provides support for muscle contraction and cell communication. Buttermilk is healthy because it is a rich source of riboflavin, or vitamin B2. Your body needs riboflavin to activate certain cells in your body that facilitate the process of energy production. Vitamin B2 is also essential for the proper functioning of the liver. A cup of buttermilk provides you with 377 micrograms of riboflavin, which is 34% of what women needs to take every day. Another reason to include buttermilk in your diet is that it is a good source of protein. You get about 8.1g of protein from a single cup of buttermilk. It means a cup of buttermilk provides women with 17% and men with 15% of their recommended daily intake of protein. Your body needs protein to make and repair cells. It is also important for healthy muscles, bones, and skin. You get about 127 international units of vitamin D from a cup of buttermilk. You should get at least 600 international units of vitamin-D every day, so buttermilk really helps achieve that goal. Your body needs vitamin-D to absorb calcium. Moreover, it also helps maintain normal phosphorus levels in the body, which in turn improves bone health. Getting enough vitamin-D helps prevent disorders like osteoporosis and rickets, which make your bones become soft. Is buttermilk good for your stomach? Yes, instead of taking painkillers to deal with an upset stomach, you can rely on buttermilk for relief. It helps neutralize gastric acids and provides you with some relief. Include buttermilk in your diet if you love spicy food, which can irritate the stomach lining. It improves digestion and helps you lose weight by preventing bloating and other issues. 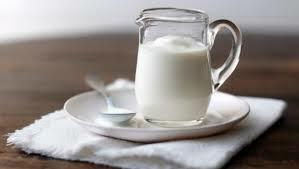 You can also drink buttermilk after an oily meal to help wash down the fat that may be there in the intestines. You can make it more effective for your digestive system by adding cinnamon, ginger, pepper, nutmeg, and other spices to it. It is better to increase your intake of water to prevent dehydration, but you can also include buttermilk in your diet for good effects. It works because it contains curd, salt, water, and spices, all of which help re-hydrate your body. Is buttermilk good for you? Yes, it is. However, you may be thinking how you can include it in your diet while keeping things interesting. Here are some great ways to use buttermilk. You can use buttermilk to prepare fluffy pancakes. It works because it contains lactic acid, which helps aerate your dough to make fluffy and light pancakes. You can actually use it while doing any type of baking. The presence of lactic acid is the reason why you can rely on buttermilk to marinate lean meat. The lactic acid content helps make meat tender by breaking down protein in it. You can marinate pork, chicken, lamb, venison, and turkey. Be sure to marinate the meat overnight in buttermilk along with a bay leaf, a few springs of thyme, and a crushed clove of garlic. Rinse it in the morning and cook. When you are too lazy to prepare anything, you can simply drink cultured buttermilk to enjoy some amazing benefits. As it contains probiotics, it is never heavy on your stomach. You can also make a quick smoothie by adding some frozen blueberries and a teaspoon of honey. You can make use of buttermilk when making your salads. It adds a subtle tang to your salad without adding a lot of fat. Simply whisk together 2 tablespoons of sour cream, half cup of buttermilk, 2 tablespoons of cider vinegar, a tablespoon of sugar, 2 tablespoons of finely chopped shallots, a tablespoon of chopped tarragon, and 3 tablespoons of finely chopped chives. Do not forget to add pepper and salt to taste. You can definitely enjoy buttermilk in many ways, but along with consuming it, you can actually take a bath in it to make your skin look smooth and soft. It works as a natural skin cleanser and is much better than harsh soaps. Is Nature Valley Granola Bar Good for You?